You wouldn’t know our son is Autistic if you looked at him. In fact, you wouldn’t even know if you spoke with him. (Most of the time) But sometimes… when things get hairy, loud, overexciting, you start to see that tiny minute difference creep out in the way he is responding to stimulating circumstances. At that moment, you can almost physically see the switch flip in his brain and slightly cringe at what that means you are about to get next. get him back to calm and move on to the next moment, challenged with figuring out what set him off and what we can do better the next time. We struggle a lot with how much of the energy, excitement, etc.. is just that of a 5 year old boy and how much of it is Autistic behaviour? As this first year of diagnosis journeys on, I’ve noticed we are becoming far quicker to recognize where the set off points might be and some of the measures we can take to better manage through those potential challenging situations. hat he was Autistic to a teacher, hoping that he was going to be so interested in the activity that it wouldn’t be noticeable. Yeah…no…not so much. We have learned that it is much better to explain than watch them get frustrated with his behaviour, explaining that you need to “chunk” down instructions instead of a quick overview. A simple example would be rather than saying “Get Dressed”, it’s better to say “Put your pants on, your t-shirt on and then your socks”. ther of us wanted to endure the frustration and challenges that might come with it. Our comprimise was a Hockey Tips for Tots…it got him out on the ice and learning the technique to play hockey without the actual pressure of the game. 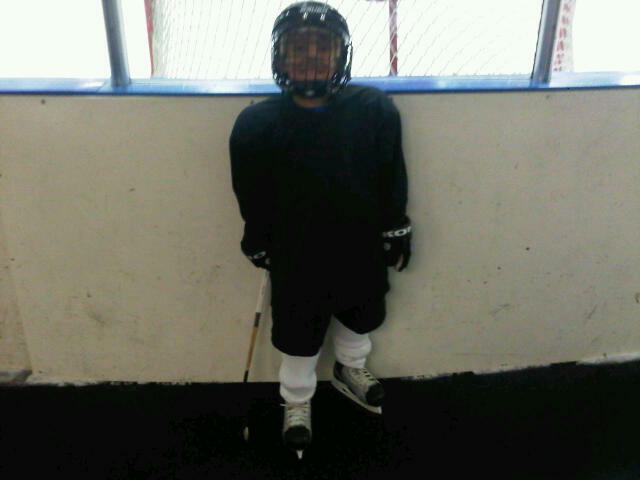 expected, with challenges in getting all the unfamiliar awkward gear on but then, by the second week, T started asking when he was going to get to play hockey next. We were shocked and pleasantly surprised that he was open to going again. We would watch him as he got on the ice and fall..over and over and over again. But he’d get back up and every week as we continue to go, he can’t wait to get out on the ice and be with his “Hockey buddies”. Our perspective is totally different than those parents around us. While they want their kids to skate fast and score a goal, we’re ecstatic that T is listening to instruction, managing the drills and willing to keep making efforts towards to getting the puck in the net.We are noticing our “goals” in life are changing but if you saw us watching T out there, so proud of how hard he was working and obviously having so much fun out on the ice, you would have thought he had scored in the final round of the Stanley Cup Finals. And that’s exactly how we want him to feel.